Who doesn't love cookies??? Well I am very picky when it comes to my cookies. I usually only eat homemade (mine) cookies. Though when I received these Bart's Cookies to review, I said sure I'll try them. As soon as I opened my box I had hands waiting for cookies. They were a hit with the kids, the husband, and even the cousin. I had to fight just to get one for myself. Ok I didn't only because I hide 12 of the cookies, just for my late night snack. These cookies say they are bite size but I got 3-4 bites out of one. They are plump perfect little cookies. They have perfect texture, not to hard, not to soft. And the chips used in the cookies are huge. These cookies are full of flavor. Every bite I took was like a little party in my mouth. As I sit here writing this review my mouth is just water for more. 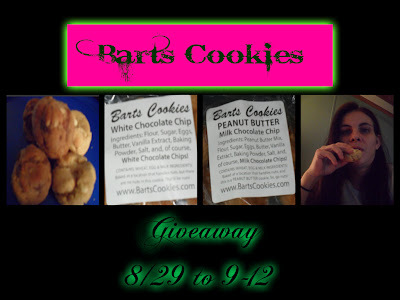 I think I might of become a Bart's cookies ADDICT.. Is that bad??? Well I don't think so, but my diet does. I might have to just run a couple extra miles by the time I finish these cookies. I thought I could control myself, but like everyone else in my home I can't. My favorite is the white chocolate chip. The husband loves the peanut butter chocolate chip ones. And well the kids, they loved both. I know you will love them as much as I do. I am very EXCITED that one of my readers will get a chance to try a dozen of these GREAT cookies for themselves. Make sure to enter via the raffle copter below. Ramblings of the Chef next door nor Riviewz & Newz are not responsible for shipment of prize. Open to US residents only. Winner will have 48 hours to claim prize or new winner will be selected. Oh these sound super good!! I would probably eat the entire bag in one sitting which is not good! I loved them all! But if I need to choose I will go chocolate cookies! Yummy! I am looking for something sweet and this post has just made my sweet tooth ache a little more. I have read a lot on Bart's and think I will have to try them now! Thank you for sharing. I would love to try these out, cookies - I would not want to share them. I'm not really fond of cookies but my husband and kids does :) they sure love the chocolate chip cookies. i am a cookie monster and so are my boys! i am sure they would love this! too bad i can't join the giveaway. I want the white chocolate with macadamia nut. This is my all time fave! I heard abut the Bart cookies before but never try yet. Thanks for the giveaway, hope to win. they have great cookies, i'm still bummed when they didn't send my extra cookies after i picked my giveaway winner....not cool!!! but i'm glad you enjoyed it. I love cookies. My husband and daughter love them too. We always have this product at home. joining the giveaway! we love cookies! A lot of consumers are raving about how good Bart cookies are so I ordered me some. I don't think I have tried their cookies before. Hmmm... don't we all love some yummy cookies. Thanks for the giveaway!